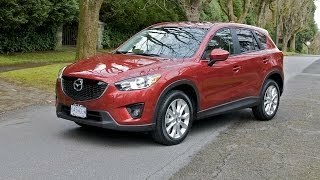 With the Compact Crossover class getting more popular nowadays, Mazda intends on joining the competition and started the production of the Mazda CX-5 2013, a CUV which may or may not ensure their success in this particular segment. Let's take a look at what the CX-5 has to offer. At first, Mazda's CUV will sport a brand new 2.0 four-cylinder petrol engine developing 162 horsepower and 155 lb-ft of torque, with an average fuel consumption of 28 miles to the gallon. What's interesting about this engine however is that it has a compression ratio of 13:1, making it the world's highest compression ratio engine found a mass-production car. 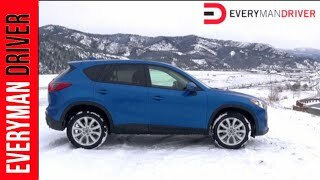 The CX-5 will be available with both front wheel drive and all-wheel drive. The 2.0 liter engine will be mated with a six-speed manual transmission as a standard, but a six-speed automatic gearbox featuring both CVT and Dual Clutch is available as an optional extra, delivering smooth operation at low revs and quick shifts at higher revs. In the future the new CUV is expected to be available with a 2.2 liter two-stage turbocharged diesel engine as well, delivering 147 HP and 280 lb-ft of torque or 173 horsepower and 310 lb-ft of torque. In terms of fuel consumption, the diesel entry-level engine is rated at 52 mpg, which is quite an achievement. 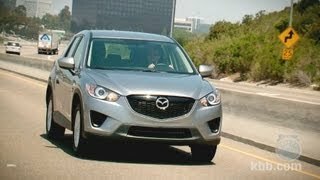 The Mazda CX-5 comes with three trim levels, those being: Sport, Touring and Grand Touring. The Sport trim level includes the 6-speed manual transmission, power windows and locks, air conditioning, cruise control, a push-button start system, an AM/FM/CD stereo and a set of 17-inch alloy wheels paired up with Yokohama tires. The available optional extras for theSport trim level includes the 6-speed automatic transmission and a Bluetooth audio package. Next in line is the Touring trim level which comes with Bluetooth and the 6-speed automatic transmission as a standard, and adds power adjusted driver's seat, a 5.8 inch dashboard display, a six-speaker audio system, rearview camera, blind spot monitor, leather wrapped steering wheel featuring audio controls, leather wrapped shift knob and rear-seat armrest. In addition, optional packages for the Touring trim level include a moonroof, a nine-speakerBose audio system, auto-dimming Homelink rearview mirror, Xenon headlamps, TomTom-based navigation, rain-sensing windshield wipers and an anti-theft alarm. Lastly, the standard Grand Touring trim comes with a new set of 19-inch wheels, a moonroof, heated mirrors and leather seats, automatic headlights, dual-zone climate control and a Bose audio system. 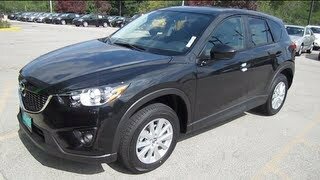 Overall, the Mazda CX-5 2013 appears to be quite promising and we're excited about its arrival on the CUV market. Mazda's new crossover will have a base price of roughly $20,700, making it more accessible than some of its key competitors such as the $22,650 Toyota Rav4, the $22,300 Honda CR-V and the $21,500 Ford Escape.